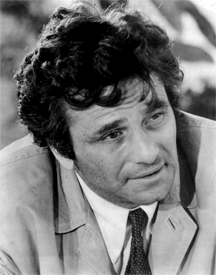 Peter Falk (1927-2011) as Columbo in a 1973 publicity photo. Columbo was probably his most recognized role, but he is also beloved for his portrayal of the grandfather in The Princess Bride . Photo by Margie Korshak Associates publicity agency, courtesy Wikipedia. You're in a meeting — maybe a phone meeting — with some powerful people who want you to explain why your project is struggling and late. There are good reasons why it's struggling and late, not the least of which is these daily meetings with powerful people who want you to explain why your project is struggling and late. The heat is on. Meeting after meeting follows the same pattern. They give you some task to do that they claim will get things sorted out. It takes twice as long as they want it to take, sometimes more than that. You report back the next day, and they're unhappier and more frustrated than they were the day before. Lather, rinse, repeat. You're sick of it. How can you break this cycle? One technique is to adopt the Columbo style of interaction. Lieutenant Columbo is a fictional homicide detective from a popular late 20th-century television series. He had an unusual personal style that was at once disarming and brilliant. By seeming to be casual, absent-minded, and not very clever, he tricked his suspects into revealing incriminating details that enabled him to solve the case. The characterization was so powerful and so effective that people write about his techniques to this day. These powerful people, who are requiring daily meetings to "help straighten you out" on this project, are usually guilty of micromanagement, if not management malpractice. They don't know anywhere near as much about this project as you do. Their offense is manifested in their belief that even though you've worked on this problem for over a year, upon their discovery that you've run into some blocking issues, they can somehow parachute in and within a week or two clear it out by commanding you to execute three to five specific tasks that are only indirectly related to what's blocking you. In most cases that I've seen, the particular tasks prescribed for "shaking things loose" involve more frequent status reports, creating "dashboards," or changing the formats of status reports. And they always want daily meetings. It's goofy. It rarely works. It creates additional obstacles and chews up resources for very little return. OK, I hope that's clear. Now back to Columbo. In project emergencies, the task of the put-upon project manager, whom I'll call Patricia (P = Project manager), is to guide the education of the members of the senior manager Emergency Reaction Force, whom I'll call ERFs. The ERFs must come to understand what the true blocking issues are. Then they must alter their own behavior to enable the people working the problem — Patricia and her team — to work the problem, assisting them as appropriate and as requested by Patricia and her team. that appears non-threateningsituation is analogous to Columbo's situation as he investigates murders. Columbo's suspect, whom I'll call Stan (S = Suspect), knows he has committed murder, and knows Lt. Columbo is investigating. But Stan is supremely confident that he can outwit Columbo, who seems like an incompetent fool. Stan feels superior to Columbo and isn't the least bit worried about Columbo discovering that Stan is the murderer. So it is with the ERF, whose members believe that their abilities are far superior to Patricia's. They believe that the cause of the difficulty lies in Patricia's limited abilities. Despite having only cursory knowledge of the issues blocking Patricia's project, the members of the ERF are confident that they can easily discern the difficulties, and quickly devise actions to point Patricia and her team in the right direction. The ERF members aren't at all interested in Patricia's views about what the problems are or how difficult they may be. How can Patricia re-educate the ERFs while under attack by them? To address that question, I'll begin in this post by outlining the three basic principles of the Columbo strategy. Then in the next two posts, I'll describe Columbo's tactics for interviewing suspects, which, it turns out, also help Patricia when she's conversing with ERFs about why her project is in trouble. So, strategy first, to be followed by tactics. OK? OK.
Columbo assiduously avoids alerting Stan to Columbo's suspicions that Stan is the murderer. Columbo is friendly, deferential, personable, and never threatening. He reveals nothing of his brilliance as a detective. Patricia adopts the same strategy with respect to the ERF. Although she's a brilliant project manager and risk manager, she never criticizes the orders she receives from the ERF, directly or indirectly. She lets the members of the ERF maintain their delusion that they understand the project, project management, and what ails this project, better than she does. Maintaining this stance can be difficult for anyone, especially if the ERFs are condescending, disrespectful, and grossly mistaken, as they often are. But Patricia is patient. She knows that what the ERFs believe about how to "fix" the project is wrong, and that they are about to be deliciously schooled. Her task is to wait, and let the project's reality teach the ERFs how much they ought to respect Patricia. As an investigator, Lt. Columbo must ask questions, and since Stan is the prime suspect, he must ask Stan questions. But he rarely questions Stan as if Stan were a suspect. Instead, he asks Stan for assistance in understanding the case. He lets Stan believe that Stan is Lt. Columbo's "consulting detective," helping Columbo crack the case. When Patricia asks questions about what the ERF directs her to do, she presents them as clarifications, rather than criticisms. Examples: "Help me understand, …" or "I'm a little confused…" Although the questions are often designed to show the ERFs how little they understand about the project and its obstacles, the ERFs always believe that they're helping Patricia become a more effective project manager. Because the murderer is intent on remaining undetected, when Lt. Columbo questions his suspect Stan, Stan eventually lies. To uncover lies, Columbo asks Stan for explanations more than once. He doesn't always ask the same question more than once, but he does ask questions that cause Stan to misrepresent different aspects of the same circumstances. Because Stan hasn't prepared his lies in enough detail, Columbo eventually causes Stan to provide inconsistent explanations. Columbo then haltingly inquires about the inconsistency, which causes Stan to dig himself into the hole a little deeper. Patricia isn't dealing with murderers, but the members of the ERF are engaged in deception. They're attempting to present themselves as more knowledgeable than Patricia about how to rescue her project, when, in fact, they are not. They might also be deceiving themselves about this. In any case, if Patricia is to be successful in enlightening the ERF, she must find ways to make the ERFs' deceptions evident to them. Seeking explanations more than once is a strategy that can accomplish this. Just as Lt. Columbo does, Patricia doesn't seek identical explanations more than once. What she does is seek explanations about the same piece of the problem, but from different perspectives. When she finds inconsistencies, she asks about them, which reveals to the ERFs that they might not understand as much as they think they do. Would you like to see your comments posted here? rbrengXKBdAWZIxjslldrner@ChacfUqDoSwQHHKvvESCoCanyon.comSend me your comments by email, or by Web form. I offer email and telephone coaching at both corporate and individual rates. Contact Rick for details at rbrenNHEaNvFAHdGbziIWner@ChacwKHEqFfmKBZyGWHOoCanyon.com or (650) 787-6475, or toll-free in the continental US at (866) 378-5470.